Peering through the entryway, a stone path leads to the temple. Everything is lush in rainy season. Hamarikyu is an elaborate garden between the office towers of Shiodome and the harbor full of warehouses, garbage incinerators, and the massive immigration office with no cellphone coverage. Inside the garden, you can learn how the Emperor created a special landscape to facilitate duck hunting that used decoy ducks, falcons, and nets. But on the edges of the garden, you can see the messy metropolis with its relentless accumulation of transportation, commerce, and recently new luxury residential development. I like how on the city side, the stone-lined canal has been preserved, and on the harbor side, an older looking flood gate still regulates the garden’s pond. As a gardener, I am a maximalist with my own small space. Approaching the Imperial Palace from the Marunouchi business district, I am struck by the grandeur of using few elements at an enormous scale. Pine, water, and stone. I found this lane when biking home from Koenji. I felt like I was in a small town, many decades ago. Tokyo is always under construction. Yet it is uncanny to see the building cranes echoing the hundreds of grave stones and wooden memorials below. The site is the former Harajuku Danchi public housing, which is being replaced by luxury apartments, directly above from Myoenji temple and graveyard. The temple has some very lovely, old trees. I wonder what type of landscape the new building will offer its neighbors. Minimal and superb Omotesando Koffee is a modular cube inside an old Omotesando house. It’s supposed to last one year, after which the building may be “reformed” as the Japanese call it. In addition to delicious coffee in a nearly hidden spot, Omotesando Koffee has the most perfect Japanese garden with two benches for seating. 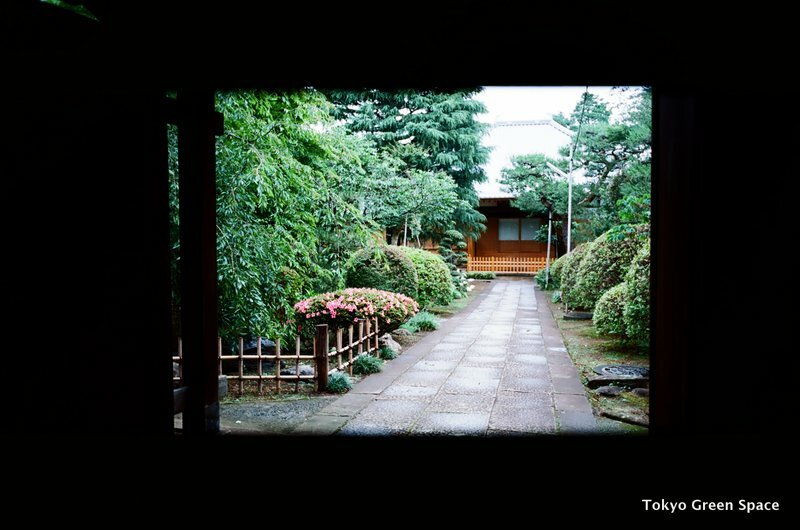 I love the stone path, old light fixtures, and the very Tokyo odd mix of wood, bamboo, and the ubiquitous cinder block. It’s a very small garden, with many traditional and resilient Japanese plants, including hollyhock, maple, and hydrangea. Worth finding if you’re in the area. Hollyhock is becoming my favorite late summer flower. For those far away, I have included an image of the sign outside (it looks like a black frame), and the clever way they turn standard paper bags into a lovely and minimal branded object. Visiting Chris and Eiko one recent Sunday, I had the chance to visit Kiyosumi garden in Fukagawa, and see the irises in bloom. Kiyosumi (清澄庭園) dates back to early Edo, and was then owned by the Mitsubishi founder in the Meiji period. It’s a lovely strolling garden with a pond. I had forgotten that June is the month to see irises, and I love how they are used in traditional Japanese gardens with running water and pine trees. I was surprised also to see so many stone lanterns disassembled. Perhaps they fell down during the East Japan earthquake, and it’s prudent to leave them down in case of after shocks. I love how this ordinary Shibuya building uses minimal natural materials, including wood, stone, and sakura branches, to create an elegant and nostalgic atmosphere. Miniature pine forest outside Japan Supreme Court. In 1970s, traditional garden joined Brutalist architecture. Would love to see traditional garden with urban forest today. Walking in Chiyoda-ku opposite the Imperial Palace, I saw this forest of beautiful stunted pine trees above a stone wall. At eye level, there appear to be hundreds of carefully twisted pines whose canopy is less than one meter from the ground. Behind this gorgeous sea of needles is the Supreme Court of Japan (最高裁判所), a 1974 Brutalist concrete building that won awards for its architect Shinichi Okada. I love the stone wall and the pine forest. In my dream, the once avant-guarde building could regain its ぷprominence by using the concrete structure to support a dense urban forest on its walls and roof. The wildness of the forest hill would contrast nicely with the austere pine forest serving as a formal moat to this newly enlivened public building. The contrast would be magnificent. 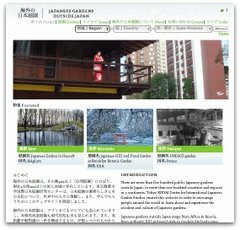 While I love the chaos of DIY gardens and the lushness of urban forests, there is also room for traditional Japanese gardens and techniques in the urban landscape, particularly around important public buildings. The contrast between heavily manipulated and more natural landscapes is a new concept at which Tokyo can excel. My friend’s stylish bonsai composition expresses autumn with elements from distant geographies. My friend Matthew Puntigam created this bonsai composition last week. It’s a wonderful expression of late autumn: the red berries, sparse leaves, and asymmetry of the plant, and the intriguing composition that creates a fantasy landscape with elements from distant geographies. The plant is, possibly, called ピラカンサス (pirakansasu) in Japanese, or Pyracanthas in Latin. I like how Matt, a bonsai apprentice, has paired the plant with a stone from Sadoshima (佐渡島), an island in Japan or Korean Sea, depending on your perspective, that served as a penal colony and place of forced exile since the eighth century. The diminutive turtle is of unknown provenance, but the slate is an old roof tile from Matt’s Maryland hometown. Thank you for the gorgeous image! My friend Endo Masahiro’s Sodateck has developed a combination LED and fluorescent grow light system for Japan. By combining the two light sources, Sodateck offers an optimal spectrum for plants. I like how his product catalog, in print and web, shows indoor gardening in a very contemporary setting: edibles and decorative plants in a chic wood and stone house with bicycles and other signifiers of modern style and living. Based in Tokushima, Shikoku, he recently exhibited his indoor gardening system at the Gardex (International Garden Expo Tokyo). It was great to see the full range of what he is creating. The systems are very elegant: brushed steel with two buttons, one for each light source type. Endo-san also brought some of his indoor plant creations, including modern bonsais like this moss on black stone tray. It seems clear that Endo-san is influenced by his friendship with modern bonsai master Kobayashi Kenji (小林健二) of Sinajina (品品). Click the link below to see some more photos of his products, including hydroponic systems with his business partner Yakumo Trading. During an October visit to Okayama, a friend stumbled upon an amazing firefly habitat in Nishigawa park, a small canal with a lovely walking path cutting through the center of the city. Although now hatching below water, as the sign above shows, it was amazing to see how a city creats an urban habitat for fireflies. And it reminds me of Professor Suzuki Makoto’s firefly project in Shinagawa, Tokyo. The firefly habitat occupies one long block of the Nishigawa park, which has different walkways, seating areas and plant arrangements on each block. For fireflies, there is a small slow-flowing, side canal where the fireflies hatch on the opposite side of the wood bridge from the main canal. A huge wall of vegetation provides nocturnal darkness and protection. I am curious how long the park has been around, and what it is like during summer firefly season. More on Nishigawa park after the jump. In urban settings, shrines and the entrances to cemeteries are open all day and night. Especially at night, they provide equal doses of nature and mystery that is both within and separate from normal urban life. These long exposure photos capture some of the magical beauty of nighttime trees, plants, shadows and stones. This experience in a nighttime cemetery reminds me of a term I recently learned from a Tokyo University professor who works at Hakuhodo: harappa (原っぱ). Harappa is an in-between urban and wild place that traditionally allowed children a space to play and explore. It could be a meadow, a grove of trees, or an abandoned building. With ever increasing construction and denser urban lives, these liminal spaces are harder to find. Shrines function as one of the most solid barriers against total urbanization. A small tip: I recently learned how to take crisp nighttime photos with an inexpensive digital camera. To avoid shaking and blurring from long exposures, use the timer and set the camera on a hard surface.